Our greatest satisfaction is hearing positive reviews from our clients. We have seen many testimonials for WGA about their ability to provide excellent golf excursions in Scotland. They clearly met our golf interests and requests in a superior fashion. But in our case, we also had a contingent of the tour that are not golfers. WGA stepped up to the plate with a full, parallel itinerary that kept everyone delighted. With a route beginning in Glasgow, up to the Isle of Skye, across Inverness and the North Sea, then back down to Edinburgh, WGA kept us all engaged with castles and palaces, distillery tours, outdoor trails and hikes, lochs, pubs, history and shopping. They booked transport, exceptional hotels and B&B experiences that made traveling easy and comfortable. We couldn’t have asked for a better tour for everyone involved. I want to take this opportunity to say thank you to you and your staff for putting together a most memorable Ireland golf trip. We had a “BLAST” to sum it up in a word. I do not know were to start in trying to explain to you what a great trip it was!!! Everything that you and your staff discussed and planned with my group and that we agreed to was there! Every reservation, tee time and sight seeing locations were perfect. The accommodations were excellent and each hotel and golf course staff people were professional and very helpful. Our driver “Tim” was an outstanding driver and took care of all of our transportation needs. I am already looking into the future to see when I can do this trip again. Rest assured your company is my first call when the time comes! If you have any customers who are on the fence about using your company please tell them to e-mail me. You have all of my information and I will tell them about our trip. WGA did an outstanding job from the get go. We knew exactly what each day was going to be well in advance of the trip. Two of our party were delayed in arriving in Edinburgh. Their delay was actually 24 hours, Ravi made arrangements to have the late arrivals picked up and brought to our location, Ravi even answered his phone at 3 am Texas time! Our driver was great very accommodating and willing to spend time taking us to other courses not part of the itinerary. We even made it it to Saint Andrews when it was looking doubtful. The hotels were over the top and worked well for older guys smoking cigars and drinking single malts. It was a trip of a lifetime for my son and my brother. Thank you, I will recommend WGA to anyone going to Scotland. You and your team got nothing but rave reviews this week. I can not tell you how many times people would say to me “Bob, great job”, and I would just respond “my work was essentially done when we picked worldwide golf adventures.”. The end of the week I told my travelers that my job all week was , essentially, “count how many people on the bus and tell the bus driver we could go”. Bottom line, excellent preparatory work by you guys allowed me to fully enjoy the week as a participant rather than being consumed with duties. Just wanted to write a quick note to let you know how much we enjoyed our Scotland golf trip last week. From the transportation to the lodging to the golf, everything was top notch. The drivers were all excellent, always on time, and the shuttle vans were very comfortable. A special commendation has to go out to our hosts Bryan and Linzi Taylor, owners of the Nethan House. The accommodations were very good, but Bryan and Linzi are what makes their B&B one of the best I’ve ever stayed in. Between Linzi’s cooking and Bryan’s storytelling, it was hard to want to leave each day. Luckily, we had some fantastic golf courses to motivate us. We were very grateful you were able to get us on the Old Course – we talked with several other people who were bummed out that they were unable to get on through the ballot. I think it was particularly tough this year given the interest generated by the Seniors Open being played there a few weeks prior. We liked all the courses we played with Kingsbarns, Carnoustie and the Castle course also being standouts. In short, thank you for all your efforts in making this truly the trip of a lifetime. We have all been telling stories since we returned home and will cherish the memories for a long time. I know golf travel is a very competitive industry and I am happy to recommend your company to anyone who is considering a trip. We hope to do another with you again soon. I cannot tell you how pleased we all were with the smoothness of the trip. Absolutely no glitches and the accommodations were great. Still getting settled in, but would recommend you a million times over!! I can’t express how your Team put together a once in a lifetime experience. I will recommend WGA to all our friends and family for generations to come and plan on using WGA sooner than later. I have to tell this past week was incredibly awesome. We played 4 fabulous golf courses, although a couple of them whipped us. Townhouse was a great place to stay and David was a great cook and very witty. Jim did a great job of getting us around and went out of his way for us a couple of days and we totally appreciate getting all this put together… thanks for everything as we thoroughly enjoyed it all. Thanks for a great trip. Everything we could have hoped for! If you want to play golf in Scotland, WGA is the team to work with. Ravi and his team made everything easy. From planning the trip to solving a couple of hiccups (not WGA issues) along the way they were great to work with. We added and subtracted people to the group as we planned and Ravi made all the changes without a problem. The folks WGA selected to work with in Scotland were great and all the hotels and venues were first class. You save a lot of money with WGA on some of the most popular attractions you want to see. I’d say we saved over 500£ on entry fees. Finally, if you are a golfer, you need to go play in Scotland…beautiful country and absolutely wonderful people at all the courses. My husband and I had a fabulous trip to Scotland and ALL of the planning was done for us. Everything worked out just perfectly. Castle Stuart was a surprise as was our Dornoch accommodation in the Tower Room – wonderful! Very responsive team (even on the weekend when our flight was delayed and changes had to be made). I appreciate all the work and had such fun. Thanks again for everything you have done and I would not hesitate to use your service again in the future. Our trip was wonderful. The courses were fabulous, the hotels great and our driver, Willie and his service were first rate. We all had a fantastic time. You exceeded our expectations. We will definitely recommend and reach back out to you for our next trip. The trip was great. We loved the golf, the accommodations, Peter our driver, the food, and even the weather. The trip was flawlessly executed and everyone had a blast. Your attention to detail was impeccable. Thank You! Thank you for a trip of a lifetime. Everything from my rental car, tee times, and accommodations were great. I had a great time driving the Ring of Kerry, going back and forth from my hotels and courses. Our group had a truly wonderful time on the trip you put together for us! I cannot say enough about how well it all turned out. We loved the Montague House in St. Andrews and the Buswells Hotel in Dublin. Raj at the Montague House was an exceptional B&B host! We enjoyed him so much, talking with him at breakfast each day and getting advise from him about restaurants. All the excursions you provided for us were excellent! Transports always showed up on time. And in the end, it didn’t matter that the guys didn’t win the lottery to play the Old Course. Thank you so much for everything! It was a trip of a lifetime we will always look back on fondly! The trip was “that of a lifetime”! We enjoyed some very special moments as father and son, we were privileged to play the Old Course, we met some truly incredible people (played with one 10 year old young girl who was 3 time world champion for her age group who shot 76 on the old course!!) and just had a great time overall !! The golf was every bit as fun as it was challenging and gave us great insight the how golf is played in Scotland! Great choices for the courses!!! The accommodation was excellent. Raj is a truly fine host and his B&B is more than we expected. Meals at Montague House were plenty-full and Raj cannot do enough to make sure you are happy and full!! He is a wealth of local knowledge and very accommodating when we asked about local restaurants or site seeing or anything like that. I would definitely recommend his B&B to anyone. The transfers from the Tour Company you used had great fun drivers and the vehicles were top notch!! WE definitely did not expect that kind of treatment for the transfers so it was great added value for us!! We discovered The Dunvegan and it became our second home!! There EVERY DAY!! Really fun place with some very interesting bar tenders and patrons. WE actually befriended a Bar Tender that was from Toronto Canada and he was someone who also had great local knowledge and great “out of the way and inexpensive “ places to eat. (he is a student studying in St Andrews so he really know how to eat cheap/eat good and drink!!). We met the former owner of the Dunvegan who had recently sold it to a Business man from Toronto and a business man from Montreal….really interesting lady and a ton of fun! This was kind of a “bucket list” trip for me, but honestly it has left wanting to do it again which I am really considering!! Not a cheap trip for sure, but one that is very rewarding in many ways! Thank You for all you did getting us ready to go and “the handy tips on how to travel”………they came in real handy. We did have great weather with very minimal rain and lots of sun…..even got shorts out a couple afternoons!!! We were very happy with your service and your company (especially when we had the connection problem at Heathrow when we arrived as they contact info you gave us made us get things figured out quickly and efficiently). WE would definitely recommend your company again and we are happy we chose you. We cannot thank you enough for the incredible family celebratory golf trip to St. Andrews. Everything, including the weather ( which I’m sure you ordered up) was perfect! Not having to worry about any of the many, many details which you handled allowed us to relax and just enjoy the incredible scenery, golf experiences and side trips to castles, cathedrals and palaces. I think you know I had some trepidation about staying in a B&B, but our guest house, the Montague House and it’s fabulous proprietor, Raj, was really one of the highlights of the trip. Our rooms were spacious and beautifully appointed and the breakfasts were amazing. Raj booked dinner reservations for us, packed breakfasts for early tee times, sent our laundry out and even called Kingsbarn to assure that the non-golfers could walk the course. The information you sent in advance was incredibly helpful! The packing list, restaurant recommendations ( still swooning over The Peat House), recommendations for sights to see for the non-golfers….all terrific. The communication throughout the planning and execution of the trip was very timely and professional. altho the guys did not get the draw to play the Old Course, we always knew in time to keep moving forward with the days’ plans. And being able to download the itinerary to the travel app. was a big help. Having the confirmation numbers on my phone when we visited Holyrood and the Stirling Castle was much better than digging around my purse, or worse yet, forgetting the information at the hotel! We would highly recommend the services of WGA to our friends, adn look forward to planning a golf adventure to Ireland through WGA. We cannot thank you enough for all you did to make this a memorable family experience. We had a great trip. The weather was especially good, with no rain while we were there. We did not need our rain gear for any of our rounds of golf. The hotel accommodations were superb and the transportation was excellent. Tommy Buckley did a great job with travel and got us to all of events timely and efficiently. The golf courses were all that we imaged, but wished we could had played a little better. We all know what heather is now and that it is tough to get out of, as well as the fairway bunkers. We can now say that we played on the number one course in the world at Royal County Downs, which was a great treat. Thanks for all your assistance and for making our trip easy and with no issues. Will definitely recommend World Wide Golf to any one that needs a professional organization to plan and organize their golf adventures. Just got back from a week of golfing in Scotland and the trip was FABULOUS!! Ravi and Jonathan put together the dream trip for us. 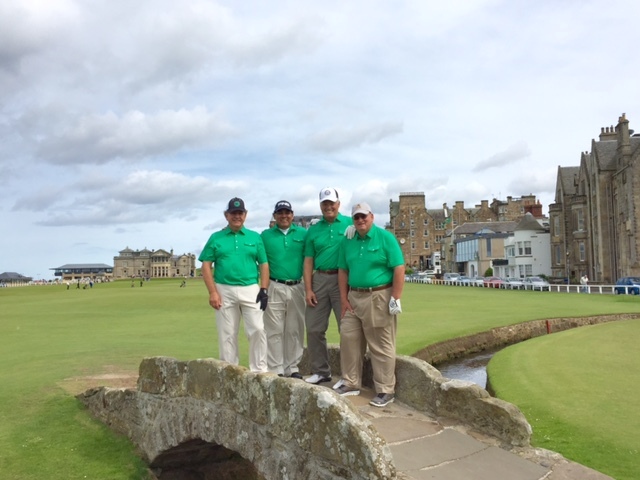 They even got all five of us on the “Old Course” at St. Andrews. The lodging at Montague House in St. Andrews was perfect. There was one hiccup with the bus company that was supposed to pick us up after a round and even though it was about 7am locally for them, Jonathan had a replacement bus there in 20 minutes. (Not sure how he pulled off that magic trick.) We’re looking forward to our next golf adventure planned by WGA. They played all the courses on their itinerary plus the Castle Course.Their favorite was Kingsbarns with the breathtaking views of the sea.The hotel was very accommodating and the location was perfect. Airport transfers and ground transportation were also very efficient. The weather was warmer than usual this time of year in Scotland which also made their rounds of golf more enjoyable.They found the Scottish people very hospitable and friendly. The complimentary sightseeing tours that were included were also very good. They liked the Golf Museum and the Whiskey Tasting at the Old Course Hotel. Thanks again for coordinating the trip of a lifetime for my clients! Your knowledge and passion for golf does not go unnoticed! I look forward to partnering with you in the near future. We want to thank you for an amazing golf trip to Scotland. Everything was perfect and went exactly as planned. The drivers were on time, friendly, flexible and we enjoyed their company. The van was stocked with beer…thank you. Our accommodations were top shelf and the view from the double rooms in St Andrews left us speechless. The staff at the Piersland was very helpful and the food and bar were great. Our first round at Turnberry started with the rain ending while we had lunch and finished with a rainbow over Trump’s hotel and the bagpiper playing in the background. Welcome to Scotland! We had 6 holes of rain out of 108 …pretty lucky, given that timing was everything. Our final round at Kingsbarns was sunny, slight breeze and a polo shirt over under armor. What a fantastic golf course. A couple of the guys in our group said that Pebble Beach, Bannon Dunes and Whispering Straits fail to compare! From all of us to you…Cheers!!! Worldwide Golf Adventures planned and executed a perfect trip. Everything was wonderful. We were planning this trip for four couples for about a year. Worldwide Golf Adventures representatives were very patient and very responsive. Communication was very, very good. Itinerary was great!!! We highly recommend this company. We’ve been on many, many bucket list golf trips through the years, most often putting in the hard work to plan ourselves. We will never do this again after our recent trip to Dominican Republic planned by Ravi. It may sound cliche, but our expectations were greatly exceeded. So much so, within a week, we were on the phone with Ravi to plan our next trip later this year. I highly recommend using Worldwide Golf Adventures to plan your next bucket list golf trip. Thank you for organizing a great golf experience to Ireland. Speaking for our group of sixteen golfers it was great. 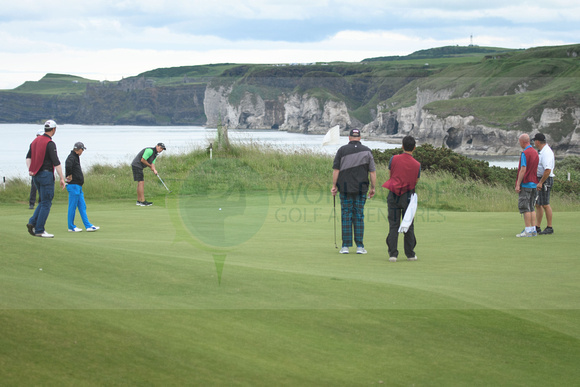 The course selections were all must play “Bucket List Courses” Portstewart, Portrush, Portmarnock, and European Club. The trip was very Professionally Organized, the hotel accommodations, Scheduled airline pickups and departures were on time and without any issues. Having a travel bus for the entire trip made for a very comfortable week, no stress just great golf. Another plus we were provided with an exceptional driver Roy Clarke. Roy was very knowledgeable of Ireland and it’s history, Made the bus rides interesting and attended to all our needs. We highly recommend Roy. Myself I have been on seven previous trips to Ireland and never worked with a more Professional company than Worldwide Golf Adventures. Oh yea thanks for the gift upon arrival. We just returned from a 3 week trip to South Africa arranged by Worldwide Golf Adventures and couldn’t be happier. We stayed in a safari lodge in Kruger National Park, golfed 7 times on great courses, hiked, visited Stellenbosch the wine area, and finished in Cape Town. Ravi had arranged everything including our drivers who were fantastic. We give Ravi 5 stars and wouldn’t change a thing. We will certainly be using them for future trips. The trip was great!!! Everything went well and we were extremely happy with all aspects of the trip.We would highly recommend worldwide Golf to other people!! Thanks for all your help! It was a great trip!! We absolutely loved working with Ravi and Worldwide Golf Adventures! During the planning process Ravi provided ideas and options, and made changes along the way to better meet our needs. My husband is has a medical condition and is not able to walk 18 holes, so arrangements were made for a buggy at each golf course. We were advised on what documentation is required for using a buggy. No buggy, no golf. This was a critical factor in my husband being able to play golf in Scotland! The transport arrangements made it easy and stress free to get from one place to another. Ravi’s attention to detail was superb. In St. Andrews, the Glendaren House B&B was in a perfect location. Maggie and Ray made us feel at home and provided wonderful accommodations and breakfasts! Communication was consistent and timely, both during planning, preparation for travel, and daily once we arrived in Scotland (to give updates on the Old Course Ballot results). When we were selected to play to Old Course ( a day after we were scheduled to leave St. Andrews for Edinburgh, Ravi presented options for re-arranging accommodations and transportation so we could stay in St. Andrews an extra day to play! It all worked out perfectly and we were able to check off playing at the Old Course off of our bucket list!!! Accommodations in Edinburgh were great too. We were able to talk advantage of several of the complimentary excursions/sightseeing provided through Worldwide Golf Adventures (especially liked the Glenkinchie Distillery tour). Thank you for a wonderful week in Scotland! The trip exceeded our expectations! We highly recommend Worldwide Golf Adventures to anyone planning a golf vacation in Scotland (or anywhere Worldwide Golf Adventure serve). Everything was perfect on the trip! I can’t think of anything I’d change. We especially loved our driver, Tommy Buckley, who was an absolute professional and acted as a wonderful tour guide as well! Thank you so much for all of your planning and help throughout the process. I will highly recommend your services to everyone! 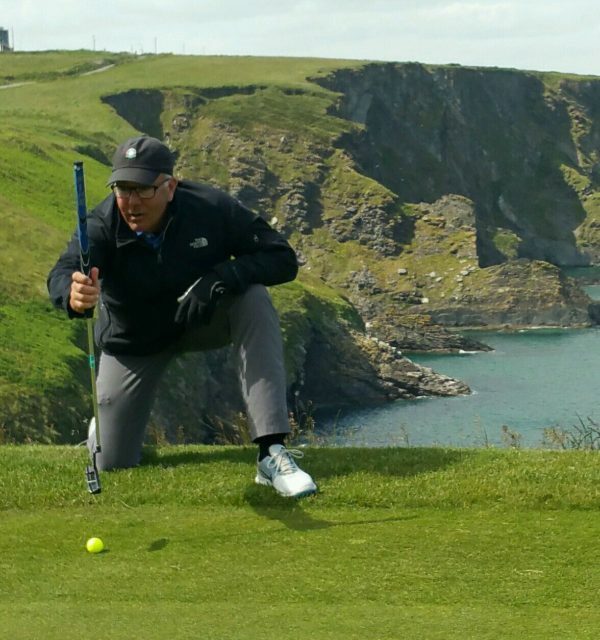 Worldwide Golf Adventures put together our first class trip to SW Ireland. The entire process was smooth and simple. The guys there do a great job listening to your needs and then putting an itinerary together. If something should go wrong during the trip (such as delayed flights), they proved highly available to help figure out how to keep the trip going and connect you with your group. Had an awesome golfing trip and I would use them again in a heartbeat. Ravi and Jonathan were great! My trip started as the trip from hell, through no fault of Ravi’s or Jonathan’s. My outbound flight was cancelled due to a mechanical and American Airlines choose to cancel it so late that I couldn’t make any flights that would get me to Shannon to meet the other 7 guys. I called Jonathan and relayed my sob story and he helped my by arranging an Airport lounge for 6 hours in Heathrow and a driver to take me to our first hotel. Then when my rebooked flight was delayed, he arranged for a hotel at Shannon airport. Once I finally met up with my group, it was first class all the way. Our driver, Tim, was fantastic and very accommodating. Calling ahead to the hotels to alert them to our arrival. Arranging dinner reservations, pointing out the sights. Restocking the coach with Guinness, beers, sodas, water and snacks. Then the hotels were all five stars. The Europe and Old Head were truly special places. The group played Doonbeg (which I missed due to my flight cancellation) , Tralee, Old Head, Dooks, Waterville and Ballybunion. Except for the first day at Tralee followed by a spectacular evening 9 holes at Old Head, the weather was crap. Sideways rain and blowing like stink. At Ballybunion, blowing 50 mph ahead of a hurricane. Such is Ireland golf, or so I hear. Anyway Ravi and Jonathan are good, but even they couldn’t control the weather. If you go to Ireland, I can’t rave enough about Old Head. It is by far the most spectacular golf course I have ever played including Pebble Beach. Sheer cliff ocean views from every hole. Waterville and Ballybunion should also be on your list. Ravi and Jonathan can help you make that happen. We arrived home on 7/13 and we wanted to thank you for a wonderful well designed and orchestrated adventure. The golf was fun, the courses challenging but most important the Irish people were kind and friendly. Ravi set up our trip for three couples to Ireland. We had three golfers and the wives went to see the sights. We flew in on Jun 17th and arrived in Shannon, Ireland on Jun 18th. We had a driver set up John Clifford who has driven golfers and vacationers for over twenty years. Ravi’s set our trip up with a fine balance of golf and sightseeing. The first part of our trip was based out of Killarney when we played some of the western Ireland courses. Everything Ravi set up was first class. The vehicle was outstanding, John had all kinds of history and pointers along the way. We played Tralee, La Hinch, Portmarnock and Dooks. I would rate them with Tralee and La Hinch as my favorites and Dooks as the weakest. John also took us to lunch at Waterville where the clubhouse was very nice and the course looked fantastic. Ravi had all kinds of sightseeing recommendations and entries which we took advantage of castles, boat tours and museums. Our only complaint as an American is the weather was warm and most hotels in western Ireland don’t have air conditioners, that was not Ravi’s fault just part of the experience. From the time we stepped off the airplane to the end of the trip everything was set up. Each time we checked into a hotel we were never asked for a credit card for incidentals or anything else. Breakfast was included at all hotels. When we had early tee times the hotels would allow us to come in early and eat the continental version of the breakfast. We only did an Ireland golf trip. When we go to Scotland in a couple of years we will no doubt call Ravi to set up our trip. We finished up the trip flying home from Dublin. Request John Clifford as a driver if he is available you won’t regret it. My guests and I were very satisfied with the program you organized. The service and communication was professional and accurate. We thoroughly enjoyed the experience and would highly recommend Worldwide to anyone. Look forward to working with you in the future. We had a wonderful time and were pleased with everything! We have already spoken highly of the experience to our friends. And – we plan to return at some point! Must say we were a little apprehensive, but that quickly disappeared when the car rental was quick and easy, accommodation, golf and sight seeing items all went like a charm. We were warmly welcomed everywhere as your company name and our names were on everyone’s list. Golf was great, warmly greeted at most courses by the pro and presented keep sakes from their course. Caddies were good and needed on most courses as some you could easily get lost. We enjoyed the trip immensely and to not have to be concerned about anything was a real treat. We recommended your company during our travels to other golfers and will continue to recommend. We are considering a golf trip to Scotland In the next 2 years and will be calling on your company again. Thank you for our great Ireland golf experience !!!! Back from our trip this afternoon. I cannot begin to express my gratitude to you and your company for an excellent trip. The logistics were flawless, the hotels were all wonderful, the golf was memorable and the weather was perfect (ok, I know you had no control over that aspect). It was a remarkable experience for the whole family. If someone asked me for a recommendation for a company to set up a golf trip I would tell them to contact you. Thanks again for a wonderful experience. Just wanted to thank you for everything from setting up the trip all the way through assisting us while there. The trip was fantastic (other than the weather) and we appreciate everything you did. Returned yesterday from our trip to the Home of Golf so I thought I would let you know what a great time we had while it is still fresh in my mind. Everything you set up worked out perfectly. The accommodations, transportation, course selection and everything you did to co-ordinate the whole trip was flawless. Not having to worry about all the details made this the trip of a lifetime we were all looking forward to. We experienced everything we had hope for. We had perfect weather for 4 of the 6 days we played. The second day at Royal Troon we had the full “British Open” weather experience with 25 MPH winds and rain on the back 9. We finalized our trip at the Old Course at St. Andrews where we started in the fog, Once that lifted we played the next 6 holes in short sleeve sunshine followed by 2 holes in thunder and lightning ending in a beautiful rainbow. We ended the round in light sweaters with a birdie and 3 pars on the 18th hole. I will be highly recommending you to any who ask us about our trip to Scotland. Thanks again for a job well done! I wanted to thank you for all your help in planning the trip to Scotland and let you know that we had an amazing time. Everything went smoothly and the entire trip exceeded our expectations, including weather in the 70’s 3 of the 5 days. We wanted to let you know that we would gladly recommend you to anyone who inquires about a similar trip in the future. I want to thank you for putting together what turned out to be a fantastic trip. All of the golf courses were spectacular, the Montague Guest House was just a delightful place to stay and in a great location and even the car rental company was a pleasure to deal with. Thanks again for everything. We’re back and couldn’t be happier to tell you that we had an absolutely fabulous trip. Thank you for all you did to make sure it was spectacular! The trip was amazing, everything you set up for us was perfect and we had zero issues! The Castle View guest house in Inverness was spectacular. Elenor was beyond accommodating and nice and I hope you continue to put people up there! Every course was top notch, the people were so friendly, the caddies were awesome. I would recommend your company to anyone looking to travel for golf. Thanks again for everything and I hope we have the pleasure of doing business in the future as well. Ravi, our trip was wonderful!! Everything you set up went without a hitch. No problems with accommodations, the van or golf. Speaking of the accommodations – the Castle View Guesthouse was neat. Don and my room looked right down on the River Ness with the Inverness Castle right across the river. Inverness is a cool town with lots of restaurants , pubs and shops! Eleanor the proprietor of the Castle View could not have been nicer or more accommodating – and the spread she put out for us for breakfast every morning was a feast. Loved it!! I strongly recommend you continue to use that property. As far as the Rusacks Hotel – OMG!! What a neat hotel and the rooms we had looked right down on the 18th fairway of the Old Course. A view to die for!! The city of St. Andrews was so cool. I wish we would have had more to do more sightseeing. All of Scotland that we saw was magnificent! And the golf – Holy Cow! What can I say? We not only played some of the greatest golf courses – but we were standing in history!! The best trip ever!! Thanks for all you did with our arrangements! Everything was perfect! Matt made the right choice using your company. I will recommend you to my golf buddies. The trip that you put together for us was the finest golf trip and one of the finest vacations that I’ve ever enjoyed. The choices of courses were outstanding. As with many vacations, the lesser known places like Cruden Bay and Royal Aberdeen were my absolute favorites. The MacDonald Russack and the Kilmarnock Arms were great choices and lent local charm. The service at both were stellar. As excited as I was for this trip the actual event was even better. All of your selections and access to some of the finest courses in the world could not be topped. Thank you so much for putting together the trip of a lifetime. Everything went off without any issues. We had only one day of partial rain and with the wind we still got a good feel for links golf in Scotland. The hotels, venues, transportation and meals were all were top notch! We couldn’t have had a better driver. His politeness, knowledge of the courses and the history and the area restaurants were perfect! The group will definitely promote your company’s name to our friends and colleagues. For many of us this is our 20th year of golf trips as a group, this was probably the best! Thanks again for a well designed adventure! Last week seems like a dream now! WGA did an outstanding job on this tour and I hope to have the opportunity to join you again on another escorted tour. I could see how hard you and Jonathan worked to make this trip perfect for all your guests. The hotels were great and the golf courses phenomenal! I wanted to drop you a line and say thanks. We had a great trip. It was actually perfect. From the transportation to the golf to the hotels. Perfect. Paul our driver was a great guide and driver. He couldn’t taken care of us any better. I will recommend anybody to you for future trips and look forward to working with you in the future. We all said we will do it again in 3 year. Can’t wait! What an amazing experience in Scotland! The courses were absolutely beautiful, and unlike anything I have ever seen before. Big thanks to Worldwide Golf Adventures for making our experience easy and stress-free. I’m already thinking about my next destination! We had an awesome time, that was one great trip! The courses were outstanding! The driver was awesome, very personable, knowledgeable and suggested some great places to eat, have a pint and catch some great music. He was outstanding, please pass on our gratitude. It was an awesome trip and I appreciate your hard work. I would just like to send along my thanks to you for the incredible Scotland/Ireland vacation you put together for our 11-person group. I know you specialize in golf vacations and tours but even the non-golfers among us were overwhelmed by all the wonderful places and things we experienced. Everything was absolutely first class. Our drivers were great, the hotels were absolutely perfect, the sightseeing was fantastic, and the golf…, well, all I can say is WOW!. You really nailed it with your recommendations, all six courses we played were incredible. Just an absolutely great mix. 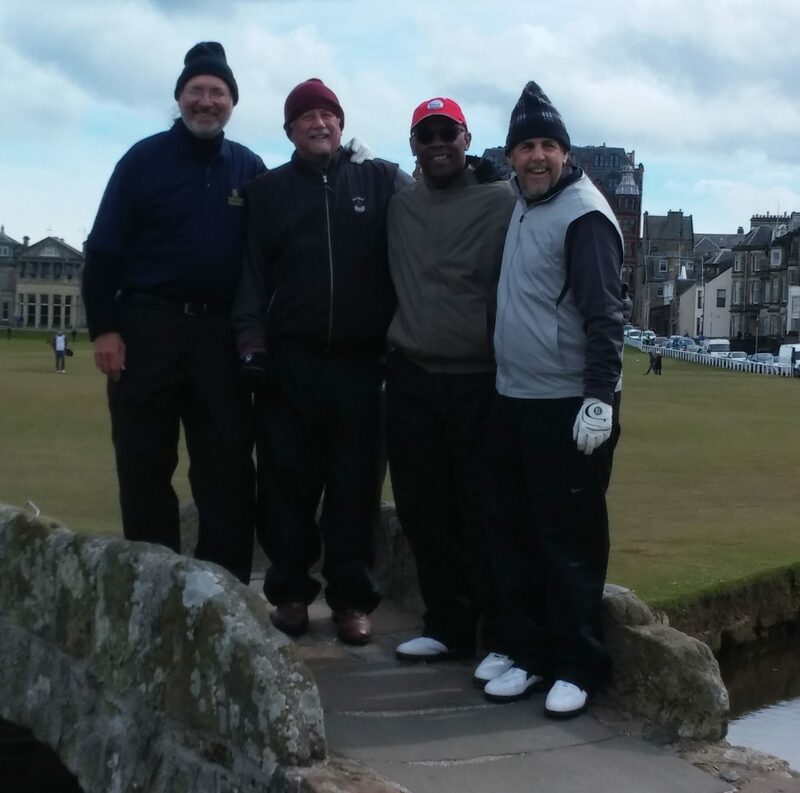 It was just amazing walking the Old Course with my buddies in the footsteps of golfing legends. That’s what I wanted as I celebrated my 60th birthday. Thanks for the assist. Oh, and the champagne, cake, and other goodies you provided to help us celebrate when we arrived at the Old Course Hotel was something I’ll always be grateful for. For that and for all the other little details you orchestrated that made this trip so extraordinary, thank you. The memories (and pictures) will last a lifetime. We look forward to working with you again on future tours, and we won’t hesitate to recommend you to others who want the same royal treatment we received from Worldwide Golf Adventures. Just wanted to let you know how much my son and I enjoyed our trip to Ireland. Everything was outstanding- the courses were fabulous, the accommodations comfortable and the exposure to Irish culture much appreciated. Thanks again, we had a great time. The trip was wonderful. It totally exceeded my expectations. The driver’s were fantastic. They were very knowledgeable about the area, the history of the area, the best places to eat, shop and visit. I had a spectacular time and would highly recommend your services to friends and family. Thank you for a fantastic journey through beautiful Scotland and Ireland! Our trip to South Africa was everything you said it would be and more! The trip was arranged flawlessly and we felt like you allowed us to see the best of South Africa so we can’t be more thankful for the work you did. Will certainly recommend you to anyone looking to travel. The trip went perfectly. The bus driver was outstanding and it only rained on the back nine of Portrush when the photographer was there. I am absolutely happy with the trip Worldwide Golf Adventures put together and I will, without a doubt, recommend your services to my friends. I’m writing to thank you for putting together a tremendous trip. It met all of our expectations. Everything was perfect, including the hotel and course selection. We really bonded with our driver Tige. The itinerary you put together went off without a hitch. We really enjoyed the golf and were blessed with relatively amazing weather for Ireland, as we only had to don our rain gear on 3 of the nine days and, even on the days it rained, we had a lot of fun golfing. In many ways, the rain on those days made the experience all the more authentic. On our middle day of rest, we were so turned on by the golf, we elected to blow off the tour of the Jameson distillery so that we could play at the Killarney course, which is a great course and was the home of the Irish Open. As such, we played nine courses in nine days. I wish I could play today, but I am back at work. Thanks again Ravi, the bottle of Redbreast whiskey at the Mount falcon lodge upon our arrival was a nice touch, as was the souvenir shirts for each of us. I look forward to using you to book all my future golf adventures around the world. I will also tell all of my friends about this trip and suggest they use you. Bryan and I were very happy with the trip Worldwide Golf Adventures set up for us. The Brackness House in Anstruther, Scotland was very accommodating for us and we felt very comfortable on our first stop. Robert and Catriona were very helpful and gave us recommendations for dinner down at the harbour. We really liked the first golf course (Kingsbarns) that we played on Sunday and then our stay in St. Andrews was also very good. Every aspect of the trip from our car to the lodging to the golf courses were all very good and even though we didn’t get to play the Old Course we still had a wonderful trip which we will always remember. Your service was timely and accurate and you took the guess work out of our stay. You communicated with us continuously throughout the process and we would recommend your service to anyone who is looking to spend time at the home of golf. The trip you put together for our group was excellent. The trip exceeded our expectations and we thank you for being so responsive when our trip was initially delayed. We certainly plan on recommending your services to anyone interested in a golf trip. Thanks for everything. 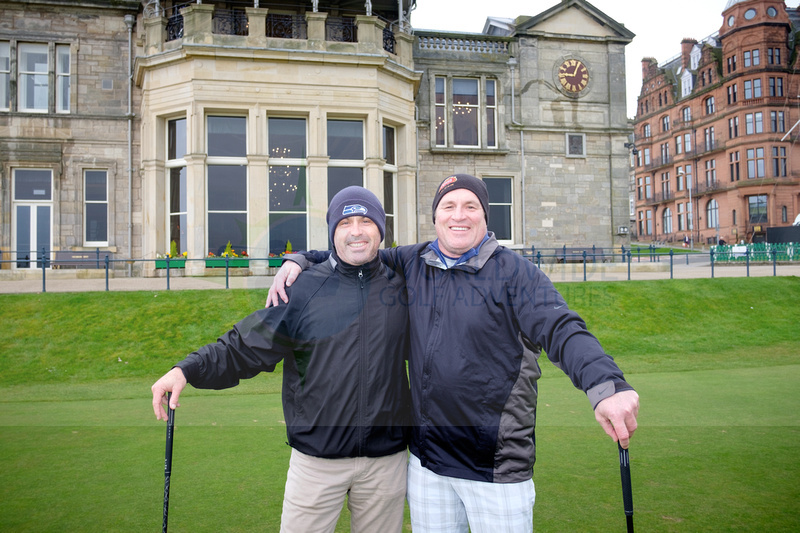 I can’t begin to tell you how grateful we all are for the way you facilitated our “bucket list” trip to St. Andrews. From beginning to end, it was a dream come true…In conclusion I’m so glad I found you guys on the internet. It turned out to be a stroke of luck that I will never forget. I will be raving about your services to everyone I know. My friends and I owe you big time. Thank you for making this trip turn key. I hope to contact you next year for a similar trip. Thank you for a wonderful trip. I really liked our accommodations, they were very comfortable and in good locations. All our golf rounds were spectacular. Loved every minute and can’t wait to go back. I can’t begin to tell you what an amazing time we all had on our trip. All the hotels were out of this world, especially the safari lodges! We shared the fairways at Leopard Creek with giraffe and antelope, and we made sure to avoid the water hazards so our balls didn’t get snatched up by hippos or crocodiles. Our guide was fantastic and really went out of his way to make sure everything was taken care of, even driving back 2 hours round trip to pick up Liz’s purse from the winery. In all, I can say without a doubt that this was the best vacation of my life and I want to thank all of you so much for putting it together. Thank you for a wonderful trip, everything went as planned! The weather was even good other than some very strong winds on the first couple of days. We appreciate everything you arranged for us and will definitely come back to you for our future plans. I just wanted to touch base with you to offer my thanks on setting up a flawless trip! The golf and accommodations were great and we had a great time! We would all like to thank you for making the entire trip a great success, if only you could have arranged for some better weather in Ayrshire! The golf was fantastic, the accommodations were spot on (staying the last night at the airport hotel was ideal), and everything was planned perfectly. Again, thanks for everything, including the shirts which we all love (nice touch!). The trip to Ireland was awesome, everything went perfect! David and I just got home and I wanted to tell you what a fabulous job you did putting together our trip to Ireland. This was truly the father-son trip of a lifetime and I know we will cherish these memories forever. I know you didn’t have a lot of time to put it together, but I can’t imagine our itinerary having been any more perfect. Ballybunion was absolutely out of this world, the wind was blowing fiercely but our caddies more than made up for it, both in advice and entertainment. After leaving my first two putts well short my caddie, Connor, said to me “You know, Michael, I can read ’em coming back too!”. You were absolutely right about Dooks too, not a course I would have thought to play but every bit as good as the others. Everyone we met was extremely hospitable, including the staff at the Malton, who recommended some great restaurants for our dinners. I can’t express enough how grateful we are to you and the rest of the staff at Worldwide Golf Adventures. I truly have no idea what we would have done without your assistance in putting this trip together and I will make sure to recommend your company to anyone I come across who is looking to take a trip. I look forward to our next trip with you. Perfect organization from your end on every aspect. No surprises whatsoever which is always very nice. The times allowed for some nice sightseeing and also no rushes from one location to the next. Well done there. 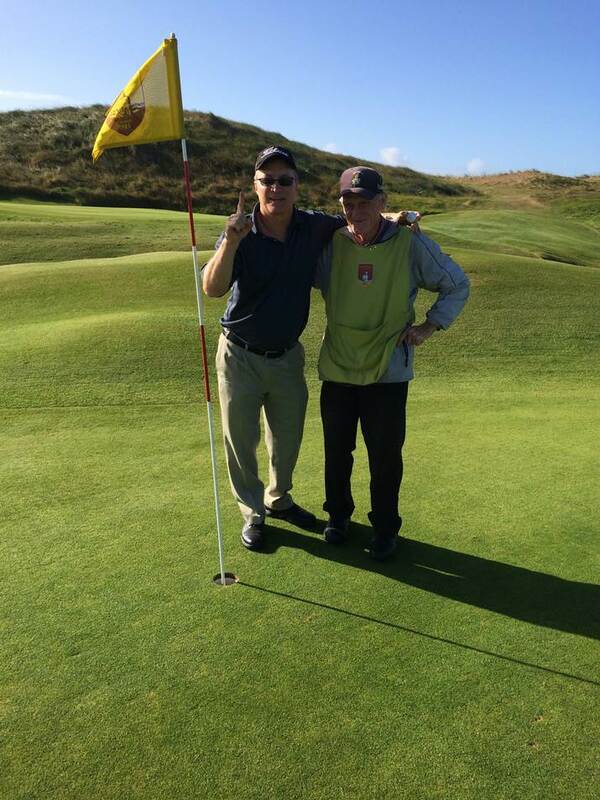 And I got a hole in one at Ballybunion!!!! My 72 year old caddie Tommy brought me my good fortune. This really made the trip extra special and memorable. So overall, great job. You did an outstanding job getting this organized, and I will definitely recommend your services to anyone.